Mentoring is separate from the line management chain. Your relationship with a mentor should however, benefit your relationship with a PI/Supervisor. Whether to tell a PI that you have a mentor is your choice; you might want to ask your PI/Supervisor for support in identifying development areas that you might want to work on with a mentor. 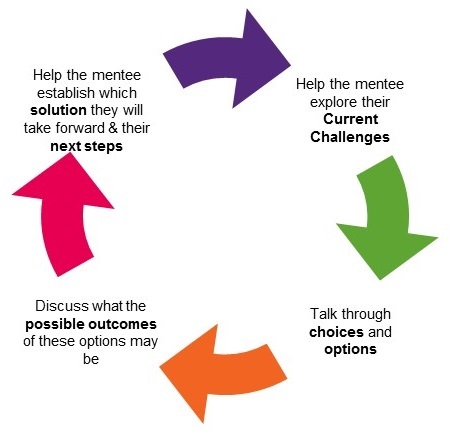 This is however not a requirement, and the mentee-mentor relationship should otherwise be regarded as confidential. Your mentor should never break that confidentiality. A mentor should not supplant the PI’s role or act as an instructor, tutor or personal friend. Instead they will provide an additional resource and complement the relationships the mentee has already developed within and outside the organisation. Mentors are volunteers. Ideally the mentor should not be from the same department as the mentee. They are most often more senior (offering wisdom and organisational awareness), and may offer insights into particular skills and experiences (including project management, change processes or leadership).